With vibrant green and punchy purple leaves, this clam shell of mixed kale is not only visual appealing, but it's also super good for you. Unlike store-bought, tough kale, with big veins that are simply inedible, Satur Farms takes the hard work out of eating your greens and does the prepping (de-veining that is) for you. All you have to do is throw it in the pan, cook it down for a bit, and enjoy the natural flavors and health benefits from these tasty leafy greens (and purples!). Personally we recommend cooking them up with a little bacon, garlic, and red pepper flakes, and finishing it with a nice bright zing of lemon juice. We also recommend that you eat it up right away before anyone else can get their hands on it. You'll see what we mean once you make this bright and tangy yet deep and smoky dish. 1. 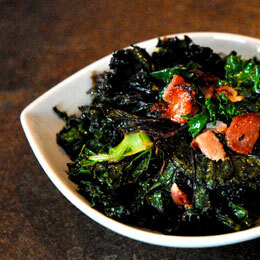 Rinse kale thoroughly, finely julienne one clove of garlic, and cut bacon into half inch pieces. 2. In a large pan add bacon and allow to cook until browned and crisped; about 4 minutes. Add cut garlic and cook for one minute until it starts to get tender. Add red pepper flakes and olive oil and stir for about thirty seconds. 3. Add kale and cover, stirring occasionally until the amount has reduced by half and the greens are tender and slightly wilted; about ten minutes. Salt and pepper to taste and finish with a squeeze of lemon juice.